Those with a passion for a rare find and an eye for exquisite detail are invited to view what’s new in the Webb-Deane-Stevens Museum (WDS) collection as the 2018 season begins. 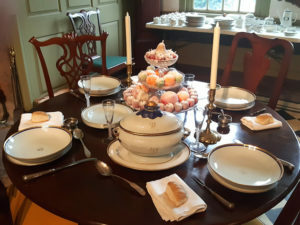 WDS Executive Director Charles Lyle points out several tiny treasures, and a couple of restored favorites, recently added throughout the museum’s three historic homes. From portraits to porcelain, the new acquisitions hail from periods ranging from the 18th to the early 20th centuries. 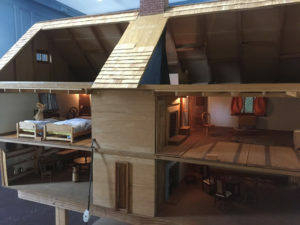 Among the acquisitions is a remarkable dollhouse modelled after the historic 1711 Buttolph-Williams House, which stands on Broad Street, in Wethersfield. Found by the side of a road, the doll house was dropped off at WDS for safe keeping. 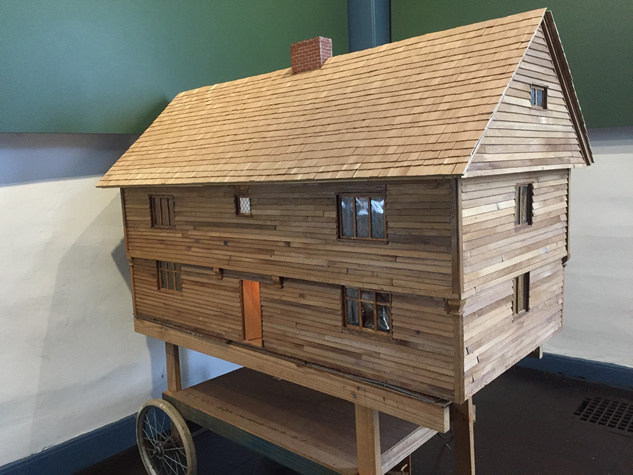 The handcrafted dwelling includes charming details: miniature Early American furniture, tiny corn-husk dolls, and miniature windows that mimic the leaded panes of the historic structure on which it is modeled, located just two blocks away. 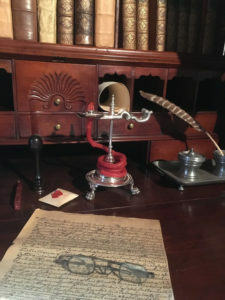 The lighted house even includes a tiny spinning wheel, and a miniature musket that will be replaced above one of the mantels once restoration by WDS guide Tammy Denease has been completed. A closer look at the beds reveals mattresses made from kitchen sponges. *Note: The Buttolph-Williams House is managed by WDS for Connecticut Landmarks. A charming 19th-century child’s pull toy, in outstanding condition, is also new for 2018. Featuring a cat beating a drum, the figure will be added to the sizable toy collection in the Stevens House, where the second floor is devoted to childhood in the 19th century. The WDS toy collection includes children’s portraits, dolls, doll clothing, and other doll houses, games, and tin and iron toys. Also new to the WDS collection, an elegant silver wax-jack, designed to make the use of open flame (necessary in wax sealing) a safer proposition in homes and offices full of potential combustibles. The wax-jack features a beeswax-coated taper coiled around a center spindle to provide a safe method of heating and softening the wax used in sealing letters. 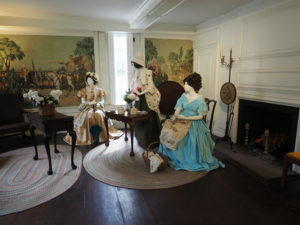 WDS has also installed two additional mannequins in the Yorktown Parlor vignette that is based on Wallace Nutting’s 1916 “colonial” picture, “Birthday Flowers,” and created for the 100th anniversary of Nutting’s acquisition of the Webb House. The new, meticulously crafted dresses were created by former tour guide, Nina Vasques, and help recreate the scene envisioned by Nutting a century ago.